Supporting our “Dream Team” of scientists, researchers and clinicians at the CERN Foundation is an essential component to reaching our goal. As part of this support we created a Scientific Advisory Board (SAB) to provide objective, expert advice to help keep us on our path to success. We were able to sit down with one of our SAB Members, a top expert in medicinal chemistry, Dr. Stephen Frye. From the age of four Dr. Frye knew he wanted to be a scientist. This early interest was solidified when he entered high school and took his first course in chemistry. His passion for science led him to North Carolina State University where he majored in chemistry and received his Bachelors degree. After graduating from NCSU, Dr. Frye entered graduate school at UNC Chapel Hill where he earned his Ph.D. in organic chemistry. Upon completion of his Ph.D., he began working for Glaxo (now Glaxo SmithKline) where he spent the next 20 years researching, developing and inventing new drug therapies. Dr. Frye co-invented Avodart, a drug used to treat prostatic hyperplasia, and under his leadership his department was successful in discovering two novel oncology drugs, lapatanib and pazopanib. 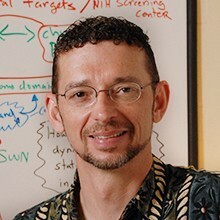 In early 2007, Stephen decided to make a move back to academics and created the Center for Integrative Chemical Biology and Drug Discovery at UNC, which he directs. In addition, he is a Professor in the Division of Chemical Biology and Medicinal Chemistry in the Eshelman School of Pharmacy and is the author of over 60 patents and publications. Dr. Frye has been married for 29 years to his high school sweetheart and his family of five consists of two sons and a daughter. Their time together as a family is often spent outdoors appreciating nature, camping and maintaining an active lifestyle. Recently, Stephen was able to spend a week with his sons backpacking the Canyon Lands in Utah and creating memories that will last a lifetime. In addition to spending time together as a family, Dr. Frye finds enjoyment through photography. In 2010, Dr. Frye was introduced to the CERN Foundation by a friend, colleague and member, Kip Guy, Ph.D. After learning more about the CERN Foundation and seeing the research and success of our team, Dr. Frye accepted the offer to join our Scientific Advisory Board. Since then, he has provided invaluable advice anddirection to our team on strategic planning – where our efforts should be focused, as well as feedback on each of the projects. In addition, his background and experience in medicinal chemistry makes him an instrumental part of our process to help determine the potential of new and approved compounds for treating ependymoma. Given the success that Dr. Frye has achieved in his own career, we know with support from members like him, we will reach the CERN Foundation’s ultimate goal to find a cure and treat this disease.